The corner of E. 43rd and McGee Streets in 1940. Middle-class families filled in the rows of homes along McGee from 41st to 43rd beginning in the early 1900s. Family members worked as railroad workers, chemists and real estate dealers, among other middle-class professions, while neighborhood children could easily walk to the Rollins School at 41st and Main. Railroad engineers, carpenters and schoolteachers made up the middle-class neighborhood along the east side of the 4100 block of McGee in the early 1900s. Most of the blocks’ families had been born in the United States, although a handful had recently come from Ireland, Sweden or Germany. Children attended the nearby Rollins school. This 1907 Tuttle & Pike map shows the street, already lined with homes. Nearby at 41st and Main was the Rollins school and the large orchard of L.A. Goodman. Larger and fancier homes lined Warwick Street, just to the west. One house that might have attracted attention – at least the attention of animal lovers – would have been Mrs. Ladd’s Cattery at 4145 McGee (McGee was called Hyde Park Avenue before 1940). Edna Ladd, wife of a real estate man named P.P., was president of the Heart of America cat society in 1921 and a well-known expert on felines. Her cats, as many as 40 at one time, had free run of the house and could also take advantage of a $300 “cattery” under the east porch, complete with heat and electric lights and furnished with blankets and cushions. Another resident also achieved minor fame for his kitchen invention. D.K. Thomas at 4121 McGee came up with those aluminum plates that go under kettles on the stove to keep down the heat. As part of our Uncovering History Project, the Midtown KC Post is taking a look at each block in Midtown, including a set of 1940 tax assessment photos which is available for many blocks. (Many people seem confused by the tax assessment photos, which all include a man holding a sign. Here’s the story behind them). Today, the east side of McGee Street (previously known as Hyde Park Avenue) between 41st and 43rd) in the Southmoreland neighborhood. Next week’s post will look at the rest of the block, including the shops along 43rd Street and the homes on the west side of the 4100 block of Oak. 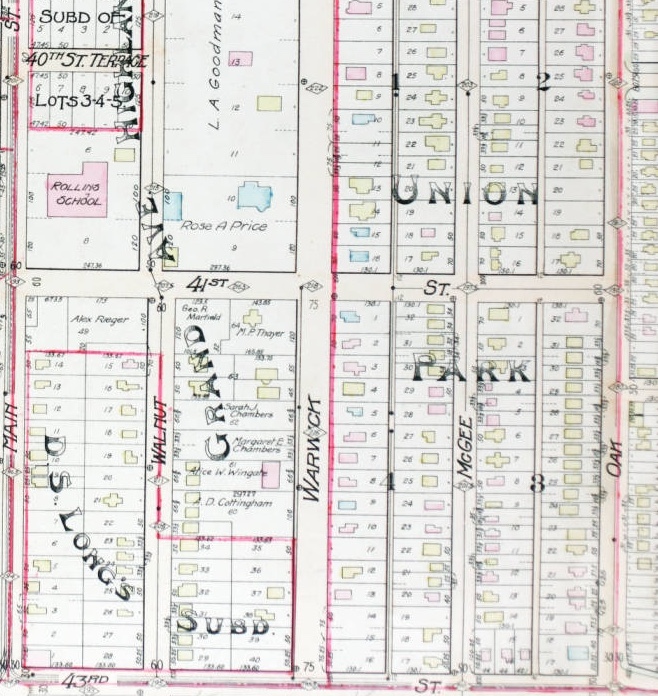 A 1909-1950 Sanborn map of the block. This slideshow shows the rest of the homes on the street as they looked in 1940. 4101 McGee: The 1910 census shows wholesale druggist William Bland, 47, wife Bertha, a son and a female servant named Emma Weide. Although servants were fairly common in the wealthier sections of Midtown in that decade, she was the only one listed on this section of McGee Street. By 1930, Loose-Wiles Biscuit Company sales manager L.S. Chaney, 50; his wife, three daughters and three sons occupied the home. They were selling chinchillas that year. 4105 McGee: Widower Milton C. Spence, 69, who worked in the stockyards, lived here in 1910 with a son and two daughters. By 1920, they had been replaced by automobile mechanic Calvin Thompson, 57, wife Minnie, two sons, two daughters, and two nephews. The Thompsons were still there in 1930 and had a boarder, Herbert Bird, 50, a material company warehouse man. 4107 McGee: In 1910, Pullman conductor Ruben S. Blossom, 42, lived here with his wife Lizzie, three sons and a daughter, and brother James T. Allen, a paint and glass company salesman. Ten years later the home had two households: lumber company bookkeeper Roy B. Peck, 36, wife Edna, and printer William A. Gordon, 33, wife Eva, one son, one daughter, a brother-in-law, and boarder Emma Bayse, 51. In 1930, newspaper carrier George Strickland, 44, lived here with his wife, three daughters and a son. They were still in the home in 1957. 4109 McGee: 1910: Single sisters Gertrude and Louise Herndon shared the home in 1910 with two boarders, Charles Brown and Morris Chalberg, a lunchroom cook born in Sweden. By 1920, locomotive engineer Oscar Rice, 51, wife Matilda, five sons, three daughters, two step-daughters, and boarder John Williams, 22, a wholesale lumber clerk, had moved in. A decade later, tool and bottle works machinist Calvin Hansen, 27, lived here with his wife and mother-in-law. A May 27, 1923 article described the invention of D.K. Thomas of 4121 McGee (earlier known as Hyde Park Avenue). 4111 McGee: From 1910 through 1930, the family of locomotive engineer Robert L. Welch, 39, lived here. Welch shared the home with wife, Ida, a daughter and a son, a sister-in-law and a brother-in-law. The Welch family stayed on at least through 1930. 4115 McGee: The 1910 census shows Mary E. Mynatt, 53, listed as married, as head of a household that included: daughter Mary, 19, a chemical company stenographer, son James, 18, a carpenter; and son Hugh, 14, a real estate farm office boy. In 1918, then-resident Ira Carrell, a striking streetcar motorman, was arrested during a labor disorder. The 1920 census several families sharing the rental home. By 1930, paint factory paint grinder Edward Royster, 52, now headed the family living here, which included his wife Hettie, a daughter, a son, a daughter-in-law and a mother-in-law. 4121 McGee: The 1910 census shows two households: contractor Floyd Crews, 52, wife Lucita; and a son; and gas company foreman Earl Keeler, 23, and wife Anna. In 1920, public school teacher D.K. Thomas, 69, wife Mary, and daughter May. T. Reardon, a 44-year-old widow, lived here. May (or Mae) became a proprietor of gift shops in the Muehlbach and Baltimore Hotels. D.K. Thomas invented a aluminum plate to keep food from burning and was selling it by 1923. By 1930, Mary Thomas, now 78 and a widow, lived here with two lodgers: Anna Braun, 40, a real estate bookkeeper, and Nora Howard, 45, a restaurant waitress. In the 1950s, Miss Geneve Lichtenwalter, a well-known Kansas City pianist, died in the home at the age of 84. She had graduated from the University of Kansas in 1892, received a master’s degree in music from Columbia University and later studied under masters in Berlin, Paris and New York. “Many of her students achieved renown in music circles. Among them were Virgil Thompson, New York music critic, and Houston Grey, New York. Will Durant, the author, was a close friend,” according to her obituary. 4125 McGee: In 1910, this was the home of James T. Harrison, 71, his wife Sarah, son Howard, 22, a chemist, daughter Ruth, 32, a millinery store trimmer, and daughter Hazel, 20, a public school teacher. By 1920, they had been replaced by bank cashier William R. Miller, 40, his wife Sabelle, four daughters and a son, all under age 20. The 1930 census lists medical doctor Edward A. Alberts, 52, his wife Grace, and two daughters. 4133 McGee: Widow Elizabeth W. Ellis, 58, three daughters and a son lived here in 1910. Two of the daughters, Edith and Pearl, were public school teachers. In 1920, real estate credit man C.C. Breeding, 43, his wife Mary M., daughter Martha, 18, and daughter Ruth, 16, had moved in. 4135 McGee: Swedish-born tailor Charles A. Bergfeldt, 44, his wife Hanna, a teenage daughter and son lived here in 1910. In 1920, residents were widow Mary Hadaway, 75, Donald Hadaway, 32, his wife Irma and daughters Maxine, 8 and Marjorie, 4. Public accountant William A. Noll, 36, wife Edna and two sons had moved in by 1930 and remained into the 1940s. 4139 McGee: The 1910 census lists wholesale drug house chemist Daniel C. Hale, 37, his wife Mary, and two daughters, ages 6 and 7, at this address. In 1920, the residents were city hall clerk M.T. Hansen, 74, born in Germany, his wife Emilie, and daughter Elizabeth, 40. 4141 McGee: From 1910 into the 1920s, widow Elizabeth Schmack lived here with: son Charles, a newspaper union assistant manager; daughter Katherine, a public school teacher; and daughter Clara, a public librarian. 4145 McGee: Real estate dealer P.P. Ladd, 61 and wife Edna lived here with a boarder, Ida C. Barton, in 1920 and were still here in 1930, when they also had two boarders, Mary B. Crosswhite, and artist, and M. Martin, sales manager at a coal company. 4147 McGee: Widow Minnie Rider, 40, a dressmaker, lived here in 1910. She shared the home with: her daughter Opal, 21, a bookkeeper; daughter Edna, 20, who worked in an iron works; daughter Alma, 17, a wholesale dry goods bookkeeper; and son Glenn, 16, an office boy at a grain company. By 1920, Ford Motor Company checker Dow Sighel, 45, wife Clara, two sons, a sister-in-law and a brother-in-law occupied the home, along with another household, public service operator John Hagerty, 56, his wife Sarah, a son and two daughters. 4151 McGee: The 1910 census found dry goods store buyer Samuel Ewing, 43, living here with his wife Mary, five sons and a daughter, and two boarders, Maurice and Earnest Lynn. Maurice Lynn and the Ewing parents were all born in Ireland. By 1920, occupancy had changed to William Reid, 49, a flour mill sales manager who was born in Scotland, his wife Ruth and son John, age 2. 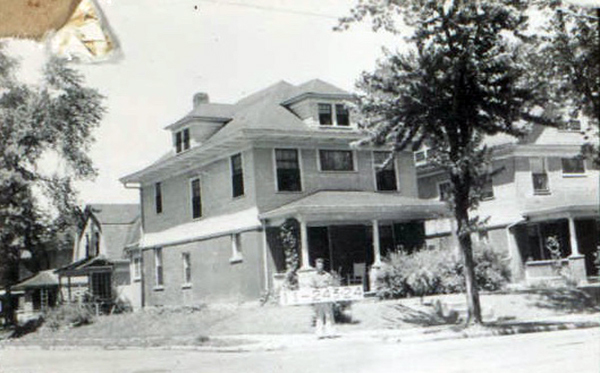 4153/5 McGee: The 1910 census shows coffeehouse salesman John Franson, wife Willie, a daughter and a son in this home. From 1920 to 1940, William Burgess, a government stockyard inspector and his wife Annie, born in England and married in London in 1866, lived in the home. They shared it with their daughter, Martha, a teacher at the Troost School. A number of years ago there were workers repairing the soffitry on my 1909 KC Shirtwaist house. They discovered–in the eaves in the unfinished attic–many receipts tied together with string. They are a “treasure trove” reflecting the business dealings with the then owner of my house. The receipts date from just before and just after the stock market crash of 1929. A Mr. Cochrane lived here at 3535 Genessee and dealt in livestock. I love these articles. I grew up on 3950 Oak between 1963 and 1976. My mother owned the house until the KC school district bought her property to build a football field for Westport High School. I shared this article with the Westport High School Facebook page. I’m sure many of my fellow Westporters will love to learn more about the old neighborhood. Thank you!